Geoffrey Household. 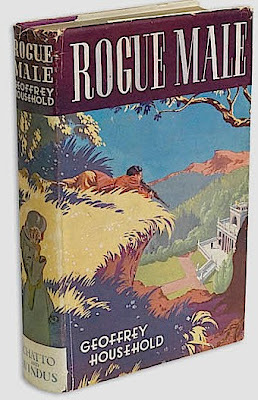 ROGUE MALE. Chatto & Windus, London 1939. A rare book as a first edition in jacket-- that is, the British edition. Even the US edition is quite hard to find. I have never handled a jacketed copy of the 1939 Chatto first. 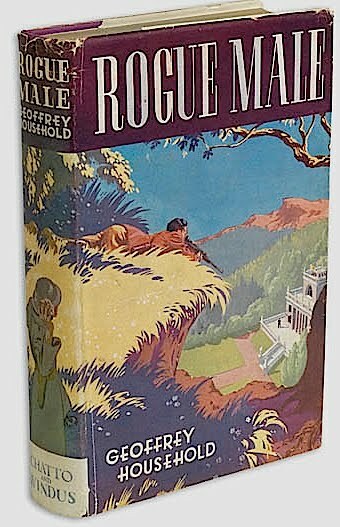 I had a copy sans jacket in the halcyon pre-internet days when jacketless copies of post 1930 novels were deemed worthless. In 30 years of dealing, 10,000 days of looking at books I have never seen a copy, except possibly as a lot in auction. Much have I travelled in the realms of gold etc.,...talking of gold it is likely that a fine, faultless copy could top $10000. A decentish copy (see photo) made $6420 in the Otto Penzler sale last year. I may be wrong, the book could now be vieux chapeau. Harrington describe their leatherbound first thus '...an increasingly forgotten tale of adventure in which a sporting tourist indulges in a spot of ill-advised envelope pushing.' However an examination of the 9 copies in auction since 1975 shows it ineluctably on the rise--from less than £500 in the 1980s to £4000+ in this century. The protagonist, an un-named British sportsman, sets out to see whether he can stalk and prepare to shoot a European dictator - obviously modelled on Adolf Hitler. Supposedly interested only in the hunt for its own sake, he convinces himself that he does not intend to pull the trigger. He is caught by the dictator's goons and tortured. Left to fall from a cliff to an apparently accidentally death he cheats fate by landing in a bog. After making his way covertly back to England, he realizes that he is still being hunted and eventually he is forced literally to go underground. During the time he spends holed up in his "hide" he ponders on his predicament and confesses to himself that he would have "pulled the trigger" as punishment for the earlier execution of the love of his life by the fascist regime. He has to use all his wit and guile to turn the tables on his pursuers and escape from their clutches. 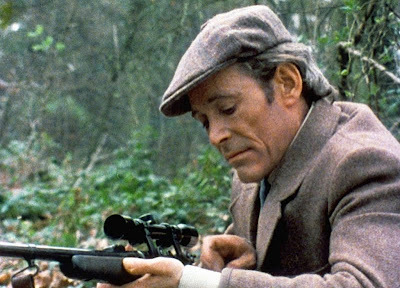 The book (and movie) was an international sensation and many actually believed a British big game hunter was loose in Europe stalking the German dictator. It was no longer a novel or a film, it had become an urban legend. The handbook 100 Favorite Mysteries of the Century called it: "The best manhunt book in history, expertly paced, tightly plotted and far surpassing John Buchan's more famous 'The Thirty-Nine Steps'." It may surpass The Thirty - Nine Steps but Buchan's The Power House is its equal and may show greater imagination and vision. I am a fan. 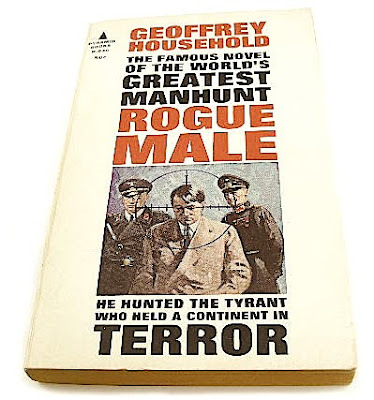 Rogue Male, for its sins, is said to have inspired David Morrell's creation Rambo and also more promisingly the great US TV series The Fugitive. It's influence on the excellent William Boyd novel Ordinary Thunderstorms has also been cited, although the manhunt there is in lowlife London of 2010. The author is not a household name (you're fired) but some of his other books are valued in the low hundreds including The Salvation of Pisco Gabar (1938) short stories with fantasy elements and his first adult novel The Third Hour (1937). A Harrington book rebound in leather? Surely you're having me on.. I'd not finished Concrete Island when I wrote that post, but having done so, Maitland does indeed come to embrace his 'island' existence, so Boyd may well be referencing the novel. many thanks for another great piece - never seen the d/w before! I love Household. One of the best writers on cats i think - Abner of the Porch is a brilliant story. Dance of the Dwarfs is one of my favourite novels and one of those books it is difficult to talk about without giving something away (like the Sixth Sense). I have an inscribed (not me to alas) copy of Arrows of Desire - inscribed to a Desmond McCarthy (but not I think the Desmond McCarthy). Oh hi. Apparently a British spy found the perfect spot from which he could have shot hitler during a parade in the early thirties, and even asked his masters if he ought to go through with it or not! Graham Greene. Brighton Rock, 1938.